It’s hard to know where to point your camera first when confronted with 80 state park and recreation areas, nine-plus light houses, numerous quaint little sea towns and miles and miles of unbroken beaches. Jagged cliffs jut straight out of the water hundreds of feet into the air and the most spectacular sea stacks stand at attention just offshore. It’s hard to find a bad location at the Oregon Coast but, some spots stand out as favorites for me. Taking Highway 26 from Portland brings you into the coast near Cannon Beach. A short, winding drive through an old growth forest and you’re at Ecola State Park where, for the great value of $5.00, you can spend the day exploring the sights. There are hiking trails that lead to stunning viewpoints on the way to the beach. Arrive at an extreme low tide to enjoy the tide pools and hidden coves at Indian Beach A tripod allowed me to select a slow shutter speed to blur the water adding a dreamy effect to my images. Heading south another favorite stop is the small coast town of Manzanita. With miles-long stretches of beach, this is a great location for a long walk with camera in hand. You won’t be disappointed. And on clear nights I head up to the viewpoints just north of town for some night photography. 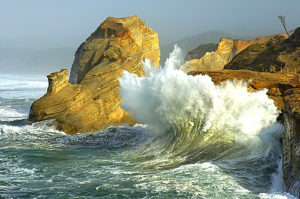 Continuing south, Cape Kiwanda at Pacific City is home to the second Haystack Rock on the Oregon coast. When conditions are good, the waves are enormous and the sandstone cliffs they crash against make a stunning backdrop. Hike to the top of the dunes for the best views. Further south is Cape Perpetua, another mountainous area with sheer cliffs descending into the ocean. The views are spectacular with the rocky coastline a perfect spot to catch waves. 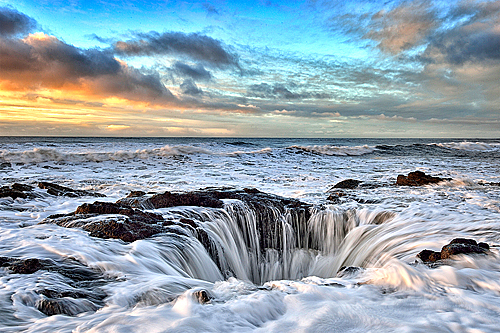 When the tides are right, Thor’s Well puts on quite a performance with water rushing into a giant bowl, overflowing and then rushing back out. 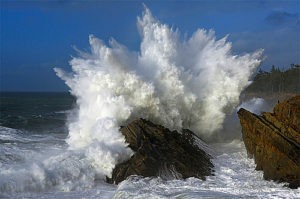 It’s not only a great photo spot; it’s quite exhilarating when a rogue wave drenches you. Cross the bridge at Cook’s Chasm and look south where you will see a blowhole (a place where incoming tides push the water through a channel expelling it into the air in great bursts). When time allows, I head even farther south to one of my favorite locations, Bandon By The Sea. 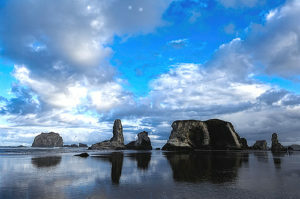 Bandon is a fun, tourist town– long beaches are dotted with incredible sea stacks. This location is definitely in the top three on my list. There are several viewpoints with sweeping views both north and south. The sea stacks make great foreground subjects against the setting sun and, on stormy days, when the waves pound the rocks and the skies are grey look for a protected place to make some really dramatic images. TIP: Never turn your back on the ocean. Sneaker waves have been known to catch an unsuspecting photographer and drench both you and your camera or worse. There are so many locations I’ve left out but space does not allow any more. 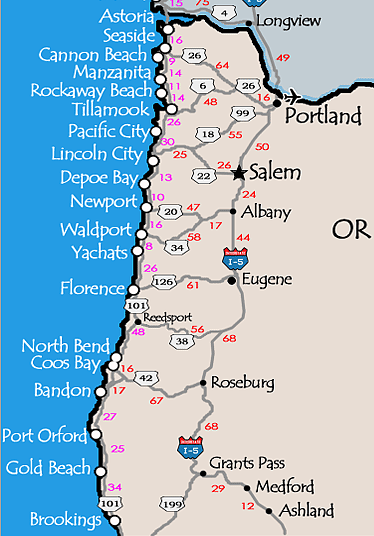 So, take these spots as a starting point, plan a trip to the Oregon Coast and find your own favorite shooting locations. See you in the field! -Protection!!! You are going to be out in storms. You will be near, large, crashing waves. You, and your camera are going to get wet. Practice safe photography! Protecting yourself and your camera will insure a much more enjoyable experience. For myself, I have a full rain suit (pants and jacket) and rain boots. For my camera, I use a protective rain cover from LensCoat [see “Resources”] that keeps my camera and lens dry while allowing me access to the controls. -Sturdy tripod and head combination. You are going to be out in adverse conditions with blowing wind and rain, water rushing around your (and your tripod’s) feet and you want to make sure your camera is safe and that it doesn’t shake during a long exposure. TIP: Extend the lowest legs of your tripod several inches to prevent resting a leg-lock in the wet sand. TIP: Push down firmly on your tripod before composing to make sure it is settled into the sand and won’t move. –Camera and lenses. I use the full gamut of lenses in my bag from fisheye to 500mm-plus, when I go to the beach. I love everything from sweeping landscapes with ultra wide-angle lenses to intimate images that can only be achieved with a telephoto. The subject, the weather conditions and my mood play a big part in determining which lens I pull out at any given time. -Remote release. For those long exposures to blur the water or for night photography. –Filters. Polarizing filters remove reflections and enhance colors. ND filter (or several) to slow your shutter down for creative effect. -Enthusiasm for an amazing adventure. Laurie Excell is a Red River Pro specializing in wildlife photography. Her work has appeared in publications worldwide and she is the author of several books about photography. Click here to go to her website. Places to visit, restaurants, lodging, events, maps, links to other sites and more. Best Red River Papers for Landscape Image Printing. 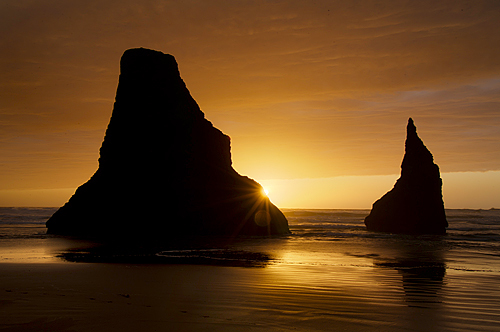 We love Cannon Beach – The coast and sea stacks offer so much to photograph. The sea stacks and shallow, wide beach at Pistol River Beach between Brookings and Gold Beach is one of my favorite shooting spots. Sunset and low tide are the best time to catch reflections in the wet sand. 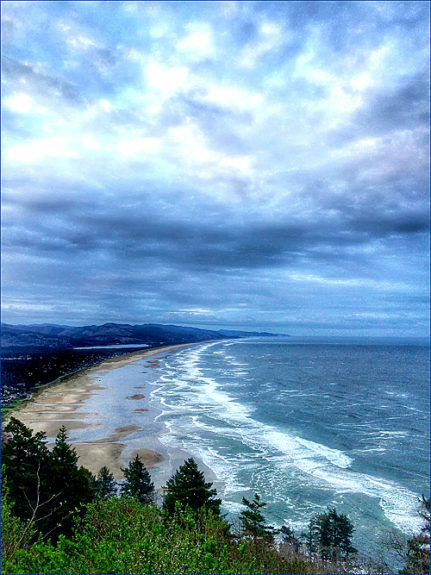 It is true that all of Oregon’s coast is a photographer’s dream.